a good time of it . . .
We had skillfully avoided all suggestions for a grand party and indeed mentioned the fact only to a few friends whom we happened to be contacting anyway. One of these was Natalie d’Arbeloff who rushed to wield her Photoshop over the photograph that appears on our website to produce this wonderful image! So, it was our Golden Wedding Anniversary yesterday and we had a very good time of it. We ate lots of delicious seafood and drank an appropriate amount of wine, sitting looking at our valley and listening to the wind in the aspen tree. We also went to a good garden centre in search of a clutch of golden trees and shrubs to make a special corner for our garden, to record the event . . . and to add to a brace of glorious Acers that had been sent by our daughter Cressida (and family) in Glasgow! We also went down to the river and stood in the silence of our own Meeting for Worship . . . and thought of our fifty years together. We may not get ‘the same again’ but we look forward keenly to whatever comes in the future. For some reason, as we stood there, some of the words of River Man by Nick Drake (cousin by marriage, I am proud to say) ran through my mind . 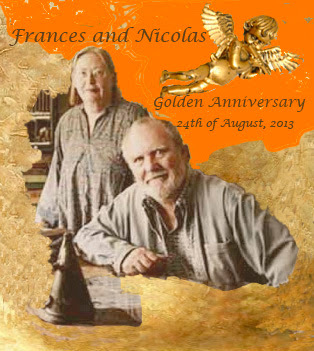 . .
May the golden trees and flowers flourish under your tender care, dear Frances and Nicolas, and still be there to celebrate the next fifty years with you…and beyond. Very glad to see my Photoshopped concoction gracing your page and to hear of the lovely way you spent The Day.